Yesterday we got the fantastic news from PADI that we are upgraded to PADI 5 STAR IDC DIVE RESORT! We can’t believe it! Only a little bit longer than three years ago, Carmelo got the idea to open his own diving centre in Sicily and look where we are now. In the last three years we worked hard to get Sea Spirit to the level where it is now. A PADI 5 STAR IDC DIVE RESORT with a brand new location inside the Atahotel Naxos Beach in Giardini-Naxos. It is a whole new standard which we achieved by working, thinking, talking, discussing, dreaming, acting, daring, be inspired…and….we are proud! We are proud on what we achieved today. It is a good start for the season for us! Last week we dived for the first time this year into the Mediterranean waters and it is amazing to be back and showing divers and snorkelers our under-water-world. We had a good start with a PADI Open Water Diver Course with Joost from the Netherlands, with confined water sessions in the swimming pool of the Atahotel Naxos Beach, just a few steps away from our new office now. Yesterday we finished the last two dives just next to the Isola Bella in Taormina with a visibility of more than 15 meters! Excellent! Our friendly diver Adam from UK is sharpening his diving skills by completing the PADI Search and Recovery Specialty and the PADI Digital Underwater Photography Specialty. After this courses, we are privileged to certify him as a Master Scuba Diver, an achievement! Pictures of Adam’s DUP Specialty will follow soon! Furthermore we took the first keen divers to the Isola Bella Marine Park to do fun- dives at the Isola Bella Marine Park and we encountered the first lobsters, moray eels, scorpion fish, damselfish, countless black sea urchins and starfishes in all kinds of colours, more colourful nudi branches like the dotted sea slug, schools of goldline breams and little orate wrasses and our personal favourite: the painted comber! 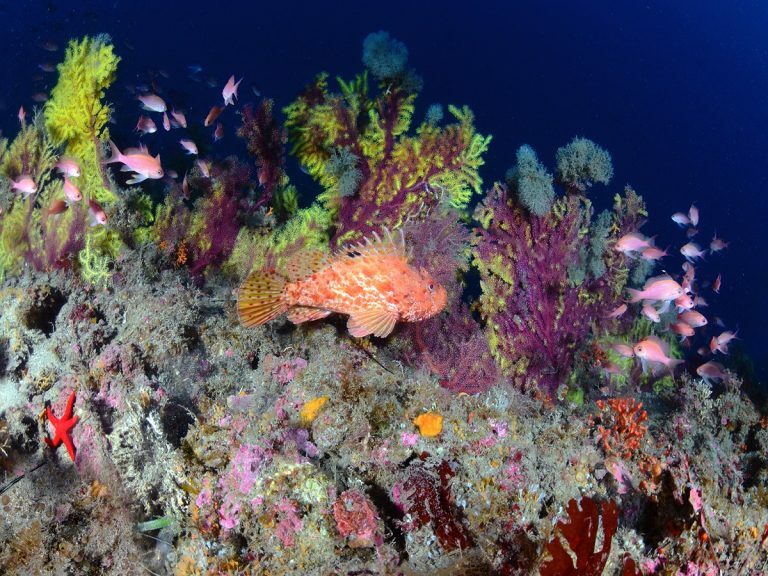 Becoming PADI 5 STAR IDC DIVE RESORT means we will organize the first international IDC in Sicily! Together with PADI Platinum Course Director Mark Soworka from dive-careers.com, we will organize the IDC at Sea Spirit Diving Resort in October this year. Stay tuned for more information!